Sellers: flat. Buyers: down. Prices: up. Seller activity was relatively flat in June while buyers pulled back somewhat. For the first time since 2010, new listings surpassed 9,000 in May of this year. That’s encouraging, even though June seller activity was down slightly compared to last year. Increasing or steady seller activity combined with a cool down in demand is consistent with a loosening marketplace. That said, buyers shopping this spring and summer will still face stiff competition. While sellers are receiving full-price-or-better offers in record time, listings still need to show well and be priced properly. June marked the seventh consecutive month of year-over-year declines in closed sales, likely reflecting the shortage of homes for sale. Strong demand and low supply means sellers yielded an average of 100.3 percent of their list price in June, a record high for any month since at least the beginning of 2003. The shortage is especially noticeable at the entry-level prices, where multiple offers and homes selling for over list price have become increasingly common. The move-up and upper-bracket segments are less competitive and better supplied. Yes, the housing market is tight out there—sometimes frustratingly so. But over 54,000 Twin Cities buyers and sellers have managed to successfully transact real property so far this year. As prices persistently rise and months of supply decrease in year-over-year comparisons, it continues to be an ideal time for more sellers to enter the market. 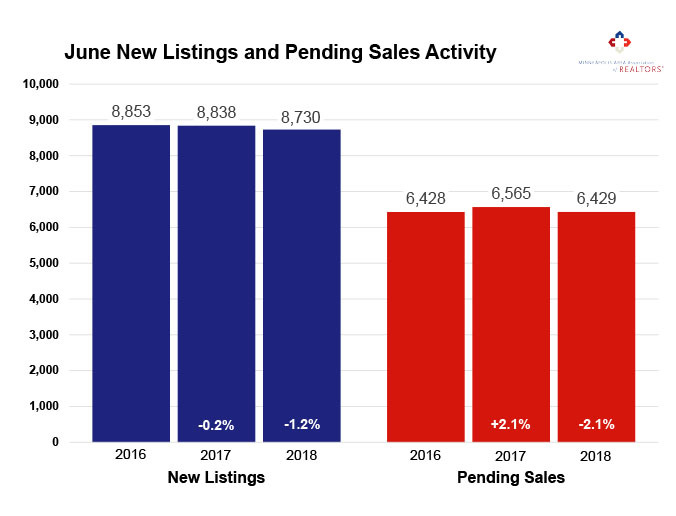 Across the U.S., inventory levels are still lagging behind last year, but new listings have perked up nicely so far this year. This has been coupled with many announced new home-building projects across the nation and a more positive tone from the building community. The unemployment rate rose to 4.0 percent in June 2018, marking the first increase in nearly a year. Economic forecasters are calling this a healthy increase indicative of more people being counted as entering the work force in an exceptional job market that added more than 213,000 paying jobs in June. Strong demand for workers combined with low supply creates upward pressure on wages. Employed people with higher wages are generally good for residential real estate. The first half of the year in residential real estate fared as expected, with the most obvious markers continuing to be low inventory and higher prices. We are also seeing decreased affordability in many markets coupled with more urgency (lower days on market) and increased purchase offers (higher pending sales) ahead of perceived future rate increases that have not yet materialized in the wake of the 0.25 percent increase in the federal funds rate. All of this makes for a busy summer. Let’s examine the local market.